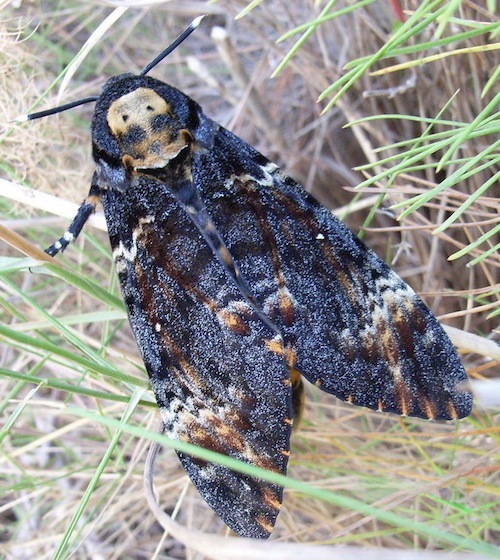 This is the Death’s-head Hawkmoth, Acherontia atropos. So called because marking on the thorax looks a bit like a skull. It features on the poster for Silence of the Lambs although, disappointingly, they edited the image to make the skull much more obvious. The resemblance is (presumably) pure coincidence, but along with the large size, dark colours, and habit of squeaking audibly when disturbed, it it has given the moth a particular sinister aura, reflected in its Latin name. In Greek mythology there are three Fates: Clotho, who spins the thread of life, Lachesis, who measures the thread, and Atropos who ends the life of each mortal by cutting their thread at the ordained moment. They are also known for raiding the hives of honeybees. Which seems suicidal. No-one seems quite sure why they don’t get stung to death; suggestions include the fact that they are covered in hair and scales; that they may have some resistance to bee venom; and, most intriguingly, that they smell like bees. » The first photo is © Pierangelo Zavatarelli and used under a CC by-nc licence. The second, from Wikipedia, was taken by Siga who has released it into the public domain. It’s very scary about the thread. The moth is beautiful. 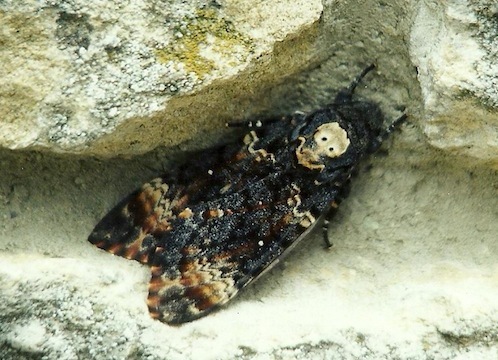 It has two relatives, one is called Acherontia lachesis, after one of the other Fates, and the last is called Acherontia styx after the river in the underworld. Which I suppose is at least thematically consistent.